I’m joining in again with Throwback Thursday which was created by my good friend Renee at It’s Book Talk. She started this weekly feature as a way to highlight old favorites and read books that have already been published. I have so many older books on my TBR that get ignored in favor of review copies and I figure participating in Throwback Thursday will help me to read at a least one older title a week! This week I chose You as it was highly recommended by many people and it won the poll I posted on Twitter haha. I have a confession to make. Sometimes when a book is super over hyped I refuse to read it just to be stubborn. Why? I don’t even know really, sometimes I think it’s because if I wind up hating it I’ll just be irritated that I gave in. Or maybe it’s because I like knowing I have a highly recommended book in my TBR to look forward to. So that’s why I’ve avoided You for the past two years but I finally felt like it was time for me to see what all of the fuss was about and I’m really glad I quit being so damn stubborn and gave in. Joe has one of the most oddly unique and powerfully strong voices I’ve ever read. It’s told in the second person as he is speaking directly to the object of his obsession, Beck which gave this such an intimate feeling. He rants, raves and rambles incessantly but it really works well here. It also gives you an extremely in depth look into the mind of a sick and deranged individual, so why in the hell did I like Joe so much?! I really did, despite his many flaws I enjoyed him and was kind of charmed by him even though it creeps me out just typing that. He captivated me and I couldn’t wait to see what he would do or think or say next. 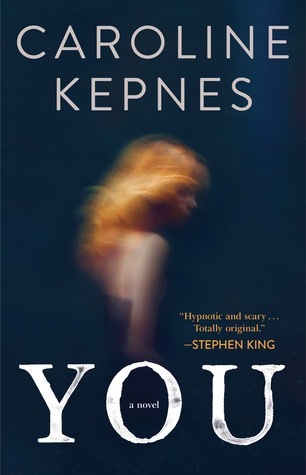 This is a super dark tale of obsession and manipulation that had me feeling uneasy and nervous the entire time. The creepiness level is at an all time high, some of the lengths Joe will go to are downright disturbing. It is sexually explicit with strong language, just a heads up for people that may not like that. But it’s also insanely well written and has an almost hypnotizing style, it’s honestly not like anything I’ve ever read before. I’ll be picking up the sequel, Hidden Bodies very soon! Yes, our love for Joe is quite twisted😂He’s one of the best written fictional characters I’ve come across in years…him and Manny..how’s that for different but yet they both like to throw around the “F” word haha! I totally get what you mean about resisting seriously hyped books, I find myself sometimes doing that as well…in fact, I’ve found myself doing that with Beartown lately but I think I will take the plunge on that one. Fun review!! I loved reading this one! I agree that Joe is a great character! Awesome review of it! Would definitely recommend it to everyone! It isn’t often that you get to read a book written in second person! This was a great review. I’m putting this one on my TBR pile for sure. Thanks! Right?! It was definitely unique. I hope you like it. I have to read this. I’ve picked it up countless times, but for some reason, I haven’t read it. I’m getting it on the top of the TBR . Loved this book! I recommend it a lot but usually think carefully about who I recommend it to- not for the faint hearted!! Oh definitely!! I think there are people who would just hate it. I can’t believe I still haven’t read this! I need to read it soon!! I recently picked this up at a used bookstore! I didn’t know there was a sequel- I might need to get that one as well.